U.S. Department of Agriculture undersecretary for trade and foreign agricultural affairs Ted McKinney said he’s bullish on the potential for future exports and imports into Central America after a week-long trade mission in the area. McKinney led a trade mission to Guatemala Feb. 26-March 2, accompanied by a delegation of agribusiness and state government leaders, seeking to grow U.S. agricultural exports to Central America’s Northern Triangle of Guatemala, Honduras and El Salvador. The delegation included leaders from 34 agribusiness and trade associations and seven state departments of agriculture. In speaking from Guatemala, he said the trade mission yielded nearly 450 business-to-business meeting. Early projections indicate it could be “one of the best” trade missions, following up on another strong mission trip to India last October. Since implementation of CAFTA-DR in the Northern Triangle in 2006, U.S. agricultural exports to El Salvador, Guatemala and Honduras have doubled, totaling $2.2 billion in 2017. In all three countries, rising GDPs and rapidly expanding urban and middle-class populations are expected to lead to continued growth in demand for food and farm products over the coming decade. McKinney said the United States is a top supplier of food and agricultural productions in the area, supplying an estimated 40% of its needs. McKinney said for a large part CAFTA is working. “It’s been a good one and we need to keep it going.” More than 95% of U.S. agricultural exports enjoy duty free access to the region under the CAFTA-DR trade agreement. Mission participants included Nevada Department of Agriculture director Jim Barbee, New Mexico Department of Agriculture director/secretary Jeff Witte, North Dakota Agriculture commissioner Doug Goehring and Washington State Department of Agriculture director Derek Sandison, as well as representatives from the Alabama, Arizona and Tennessee state departments of agriculture and the Idaho Department of Trade. McKinney also noted that the trade mission had very successful meetings with four different Guatemala cabinet level officials including the counterpart of borders and customers, agricultural minister, minister of economy and commerce and the capstone with a meeting with President Jimmy Moralez. 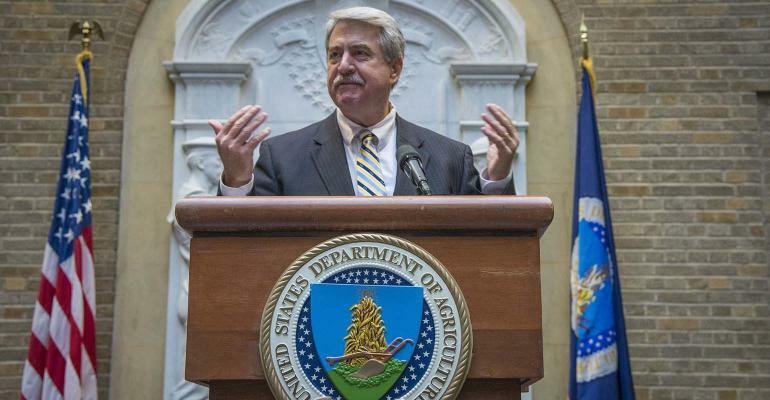 The trade undersecretary noted his notoriety and focus at USDA to be specifically-focused on trade and foreign agricultural affairs has unequivocally been a benefit in representing farmers and U.S. agricultural companies. He said without the weight of an undersecretary and clout that now exists with his role, he did not think he would have otherwise had the opportunity to visit with President Moralez. The trade mission also allowed those on the trade mission to visit a school feeding program of the McGovern-Dole program which ships U.S. commodity items to add nutrition and build partnerships with local areas of need. Another part of the mission included visits to two sides for the Food for Progress program which ships U.S. products of all types and then sold and monetized to lift up domestic grower groups. As an example, a fruit cooperative has seen remarkable growth in numbers of their members successfully raising peaches and apples from U.S.-supported Food for Progress funds.